As this post begins, I want to state the below is based on my personal experiences. I realize that not everyone may have the same experiences but hope you are inspired to try vintage style clothing. It had been years, literally, since I wore a dress or skirt. Not because I didn’t want to but because the styles I found at my local mall did not suit my figure at all. With a curvy hour-glass like I have, wearing a dress not cut for large breasts just makes you look like you’re expecting as you have to buy the dress to fit your breasts then your so roomy in the waist and bam!! You look pregnant. Skirts too were problem as they did not fit well on curvy hips and small waist as you end up with too big in the waist or too tight in the hips. No happy medium. So pants were my go-to. I would pair them with sweater tops or twin-sets as these had some stretch so they would fit my breasts and add some basic accessories like a necklace or brooch to dress up my outfit for work. Same routine each day, pants and sweater tops. Weekends were jeans and pretty much the same sweater tops. Boring! Getting dressed was not fun or an experience but just something that was done out of routine and habit. Then an epiphany occurred, it felt like the universe shed new light upon me when I discovered vintage inspired clothing styles! It didn’t take me too long to feel absolutely comfortable wearing my 50s inspired clothing styles. Many refer to this 50s inspired look as Pin Up or Rockabilly and if I had to relate to one it would be ‘Classic Pinup” as I totally love clothing from the 50s and the lifestyle. Below are my 5 motiving reasons for wearing vintage pinup inspired clothing style. When I wear my swing dresses or circle skirts I feel incredibly feminine. The dresses have so much style and flair and are cut to really enhance my hourglass shape. I can wear one of my pinup dresses and even though heaps of cleavage can show, it is all done in a lady-like way so not to make anyone around me uncomfortable. All they see is a pretty lady wearing a beautiful dress. I get non-stop compliments; men look but women and girls will come up to me, or follow me through a store to tell me how pretty my dress is and how incredible I look. Wearing my Pinup circle skirts too has the same effect. 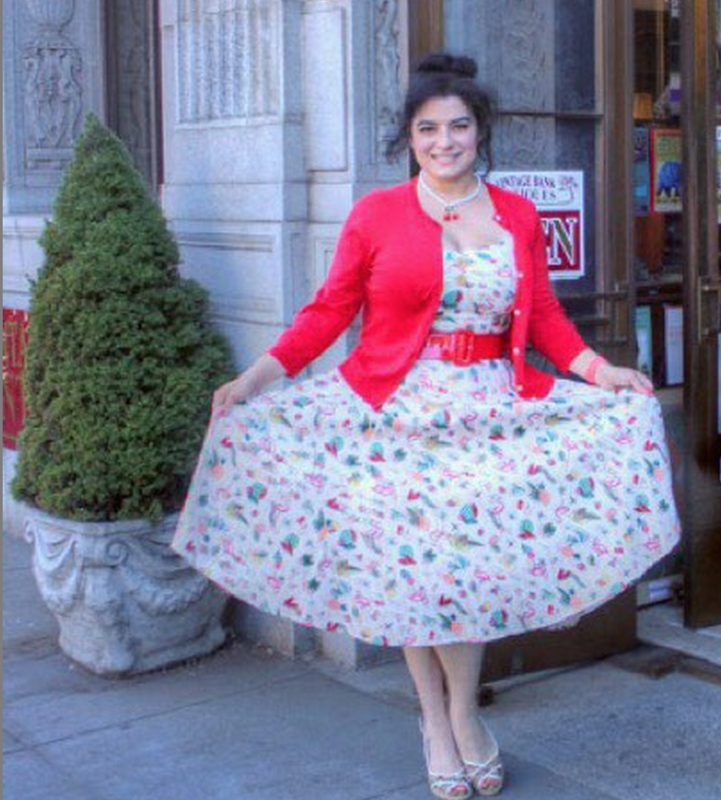 I use to think jeans and leggings were the most comfortable clothing options but I have to tell you that wearing a Pinup circle skirt is much better! If you add a petticoat underneath all you want to do is twirl. These vintage style skirts are so much fun as they come in a wide variety of prints and novelty prints and tend to be really colorful and bright. Add a cardigan and brooch and your look is complete. Again, non-stop compliments are what I receive. Your self-confidence will certainly be taken to a whole new level and you will shine brightly. Smiles, you will be smiling a lot more too! I will be the first to admit that before I started my Pinup inspired dressing, I was very insecure when it came to my body. I have very large breasts and ample hips, curvy indeed but I never wanted to showcase any of it, not even in a proper lady-like manner. I have been married for 15 years and thought as long as my husband loves me, and then no one needs to see me, coupled with the fact that mall clothing was not for me. Well, that attitude is not really healthy as it makes you self-conscious and does not let the real you shine through and you go through your years just getting by in ill fitting clothing that really drag you down. Today, I am a whole new woman! My husband will even tell you that as well, and my co-workers too. I have a whole new confidence and light. I love dressing up each day and take pride in picking out my pretty lingerie, accessories and clothing. I don’t feel self-conscious anymore. I like wearing well made beautiful clothing that flatter my curves and make feel well dressed and beautiful. I am comfortable and confident in my appearance and body. It really feels incredible to have so much body confidence. I don’t want to be bone thin, I love my curves; and so does my husband. Above I talked about how modern clothes are just not made for hourglass shapes and the difference between Pinup/vintage inspired clothes and how they are cut to enhance a woman’s curves. So, when you wear beautifully fitting clothes in great colors and patterns, and you’re receiving so many compliments + your self-confidence has sored, how can you not feel like the most beautiful girl in the world!! This is how I feel!! By all means, if you can find and also afford real vintage then go for it! There really is nothing like the real thing. Clothes of yesteryear were made so much better than today and that is why it is still around. If you are lucky enough to wear real vintage clothing, you can feel pretty sure that you are not going to run into someone else wearing the same outfit. But, if you wear vintage style Pinup clothing then you are probably not going to run into anyone else wearing it either and you will stand out in a crowd because you look so unique and pretty and people will let you know this. Being unique in such a beautiful way!! I don’t believe it is a coincidence that once you feel beautiful and confident that you start projecting this. You think it, you feel it, and now others around you are feeling it too. I noticed that even the women I work with have started to embrace their feminine sides more by wearing a skirt or dress a little more often these days. I work in the tech field and there are a lot of women that feel tech is still seen as a man’s world and women do not get equal rights etc. as well as women should be valued for their contributions and skills and not their bodies… One thing I do know, because I have personally experienced it is, if we feel good about ourselves, have body confidence, feel beautiful and dress in ways that make us feel incredible but still keep ourselves ladylike, then we reflect this and others pick up on it. It really makes an impact. I think a confident woman makes a statement especially in the tech world. Vintage Pinup inspired clothing has made a major impact in my life. My marriage has gotten stronger because I am more confident and feel great about my body; my husband really enjoys seeing me so happy and smiling all the time, more than I did before. He also appreciates the effort I put into my appearance and myself. I think he feels proud when strangers come up to me and tell me how beautiful I look. I sure love him and how he has embraced my transformation. He is also incredibly generous with me and tends to surprise me with beautiful circle skirts!! At work, my colleagues have noticed the transformation too, they can’t wait to see what I am wearing each day!! I have also received a big promotion and I think it is because of my new confidence (also the fact that I am qualified at what I do) but the confidence is what seals the deal!! If you are not happy with yourself, the way things are going in your life etc… try something new. If it is a new look or fashion style, then go for it! It could change your life in the best way. 6 months ago I didn’t think any of this would have happened to me, I was fine just going through life the way I knew how. I could not have imaged that wearing vintage inspired Pinup clothing based on the most fashionable decade of the 1950s would have given me such self-confidence and body confidence to love and appreciate my curves and have such a great outlook on life and have taken my marriage to deeper level.